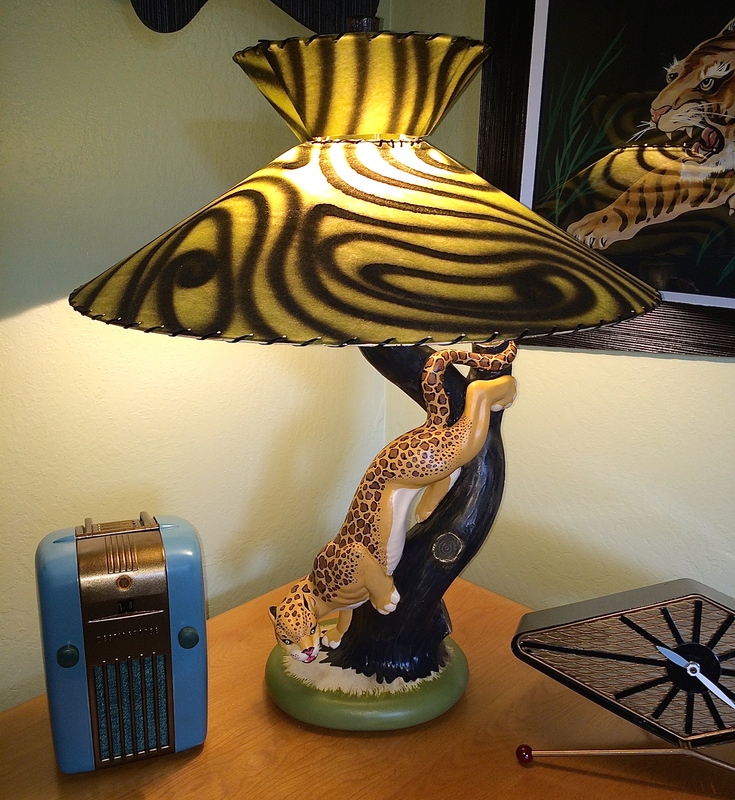 Upon review of our blog, I noticed that I forgot to show the resto on our 1951 Reglor lamps. 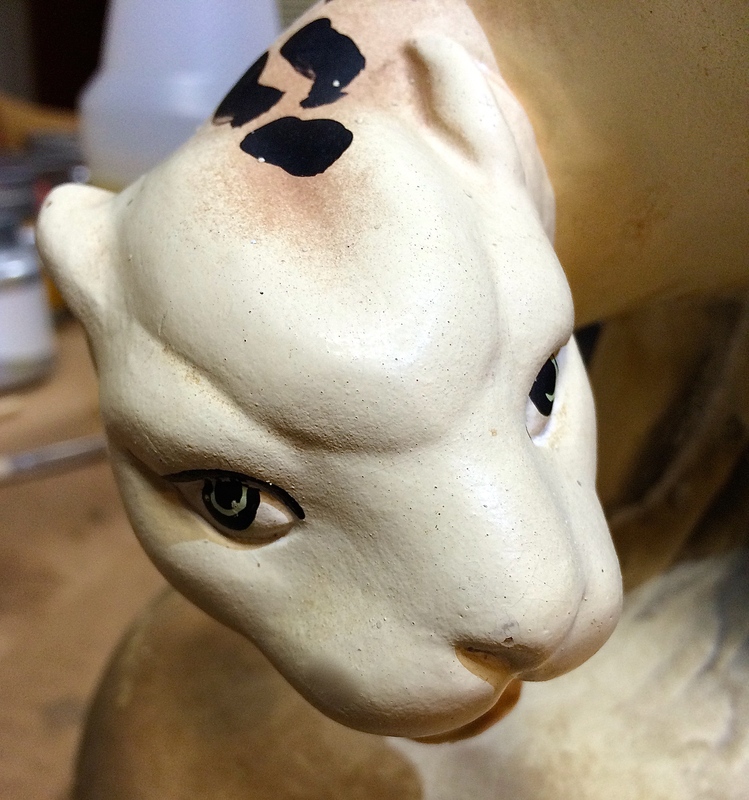 Sometimes I get too caught up restoring that I forget to blog about the restorations I complete. Below is a before and after of these. 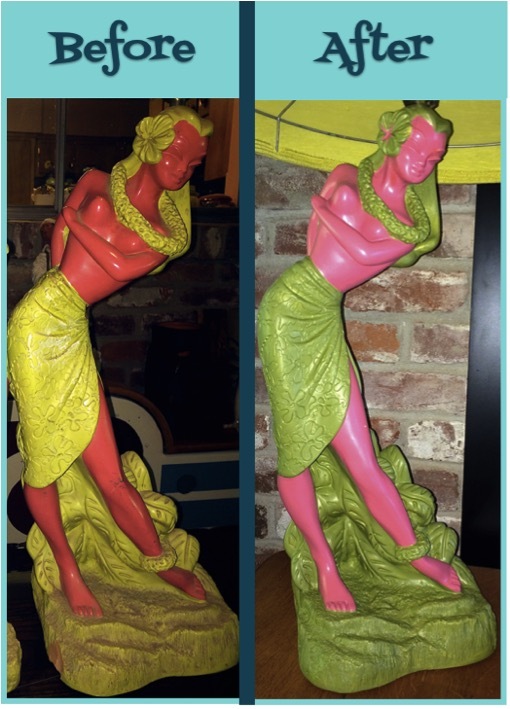 I used the same restoration process I have used on other chalkware pieces. As you can see, they are not in terrible condition, but there is some damage and years of filth built up on the surface. The female lamp had damage to her waist down to the metal wire. 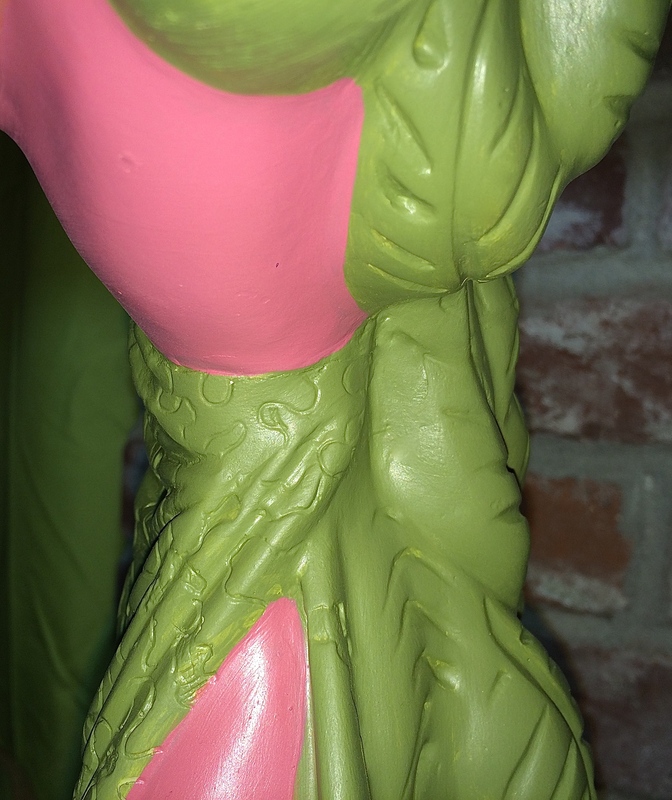 Here is the repair and repaint of the damage to her waist. I am pleased how these have been freshened up. She looks like new now! I don’t think these are the original Reglor shades, but they work. On to the next resto! 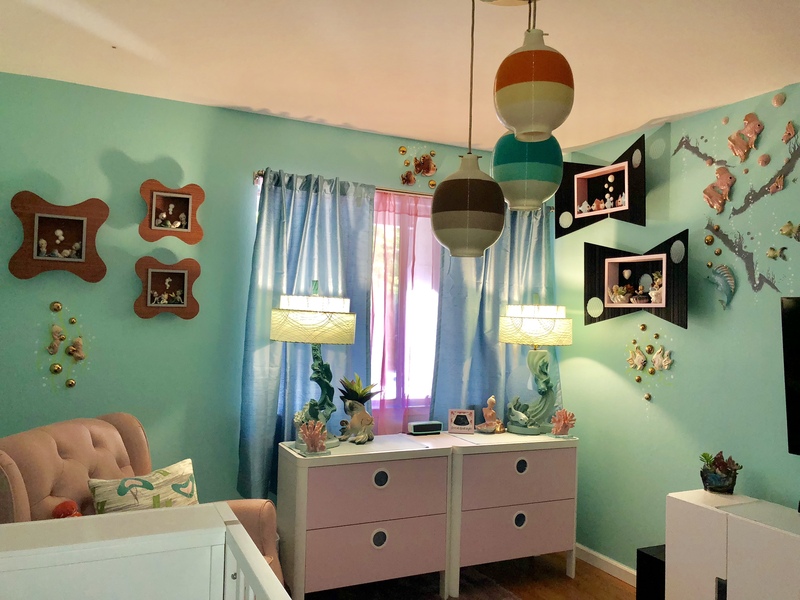 Posted in Restorations and tagged 1950's lamps, 50's lamps, atomic lamp, chalkware, chalkware lamp, chalkware lamps, chalkware reglor, hawaiian reglor lamp, Mid century lamp, mid century lamps, midcentury lamps, plaster lamps, Reglor, reglor chalkware, reglor lamp, reglor lamps, reglor of ca, reglor of california, retro lamp, vintage lamp, vintage reglor, vintage reglor lamp. Bookmark the permalink. Bernie Stien and Rena Stien began Reglor of California in 1947. 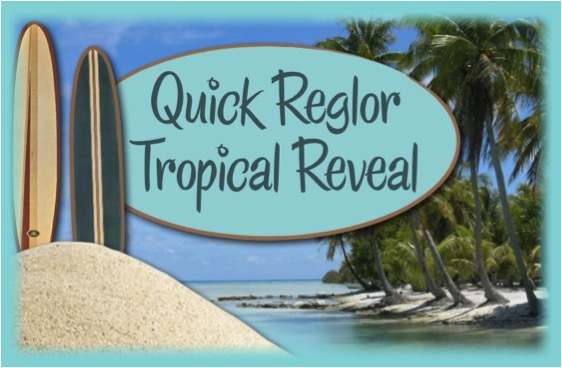 Reglor is the combination of the names Rena and her cousin Gloria. 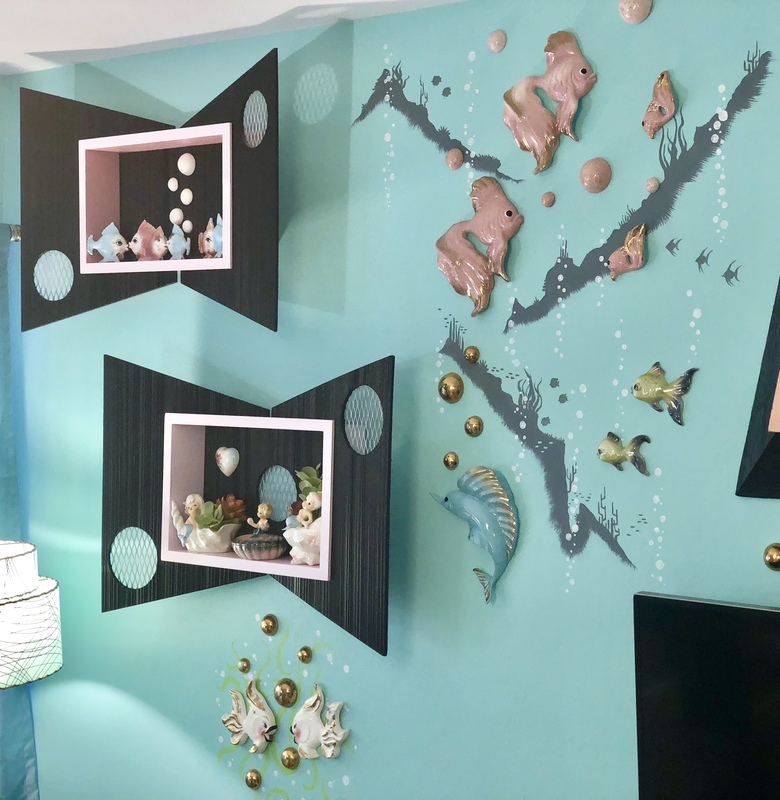 Credit for the design inspirations is to be shared with Oscar Vega, a production assistant. Regular lamps were frequently produced as a male and female pair.The distinctive shades of Reglor lamps were also made in house. Production stopped in 1975 when the Reglor factory in Montebello, California burned down. Mel and I picked these up some time ago. 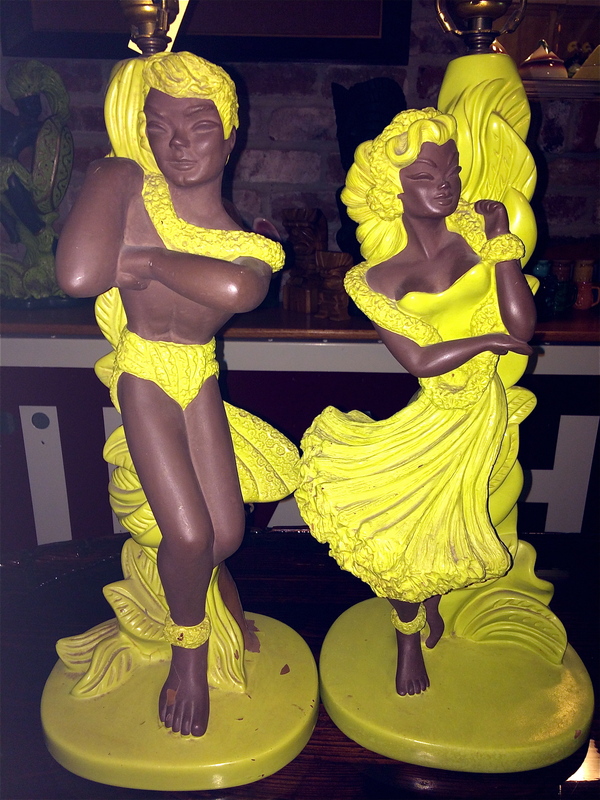 I was hesitant to buy them because the paint was peeling pretty well on the male dancer. 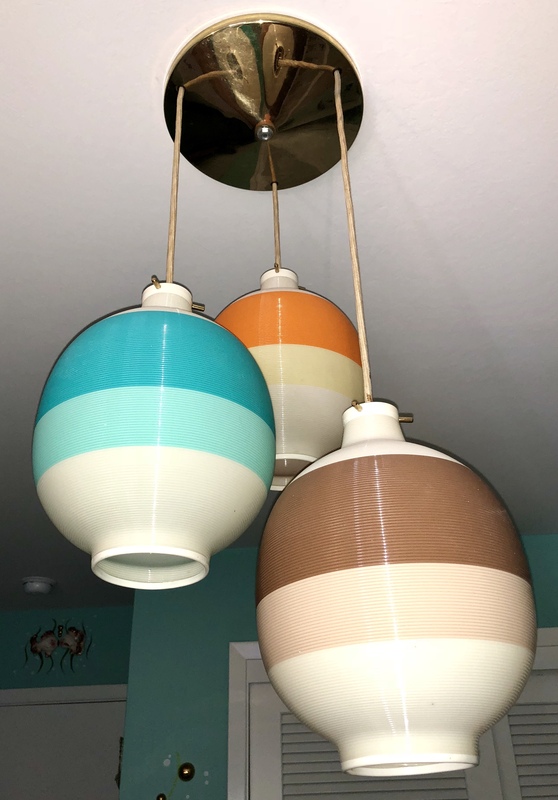 I have seen this condition issue before on chalkware lamps, and it had turned me off from purchasing them in the past. 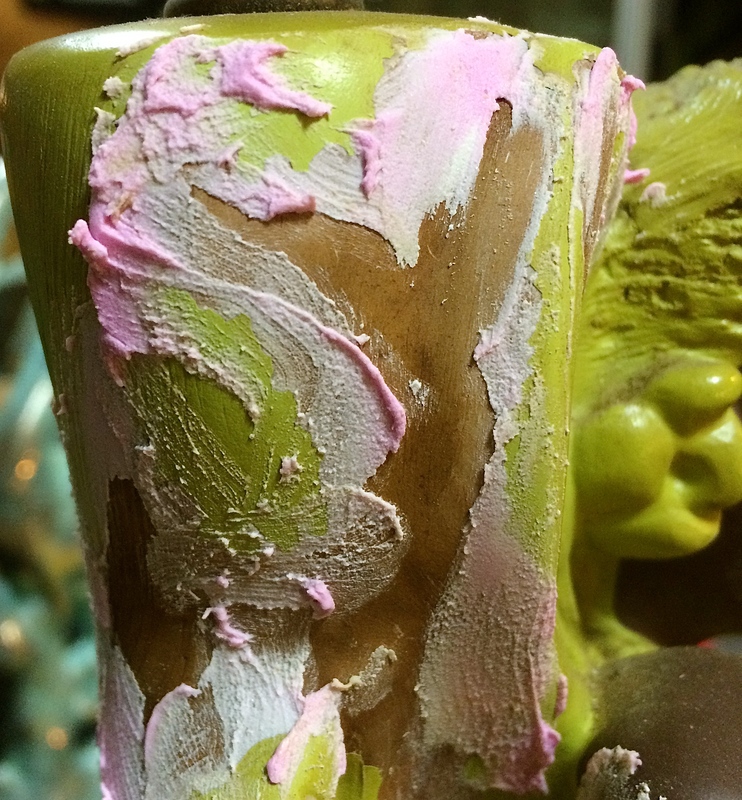 I think this happens from the lamp getting wet and the chalk underneath wicking up the water thus causing the paint to lose grip and peel off. This restoration will be more difficult than the others because it is going to take more to cover up and level up the surfaces. This is what the damage looks like. The paint bubbles up from the surface. 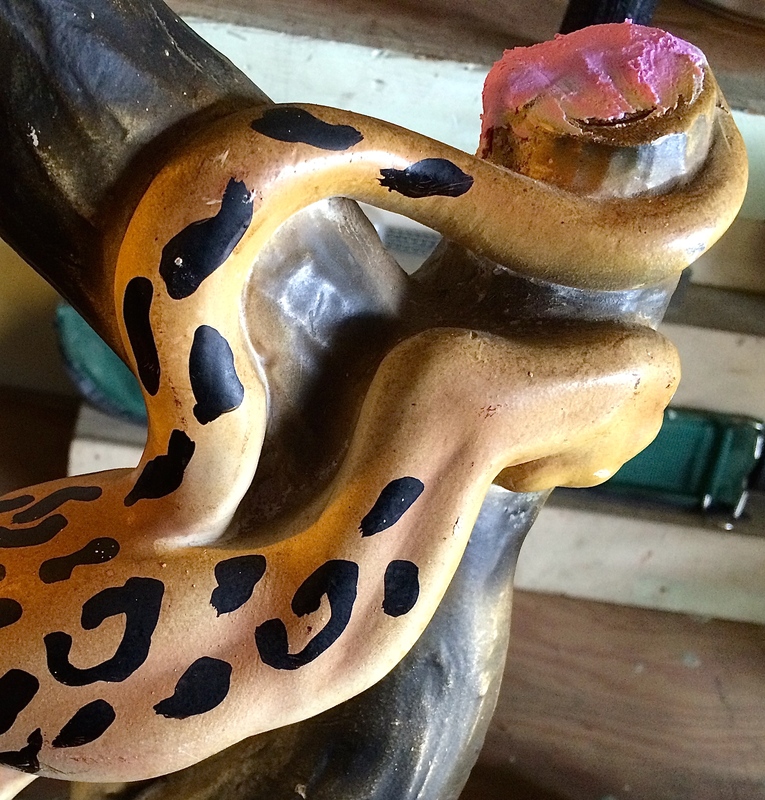 There are numerous spots on the male lamp and a few on the female lamp. To help break loose the bubbling paint I used a safety pin to get under the paint and break it off. 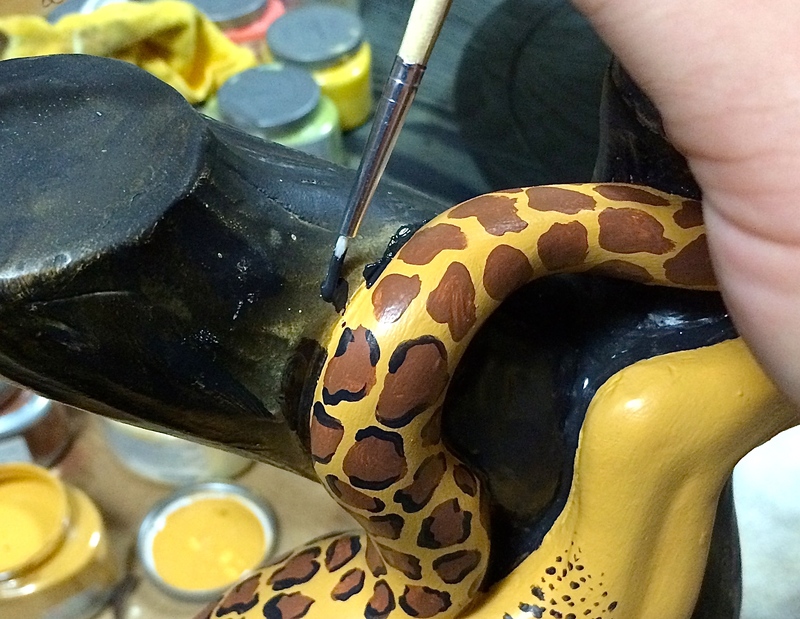 The next step was to apply the spackle on the edges where the paint loss was and let it dry. 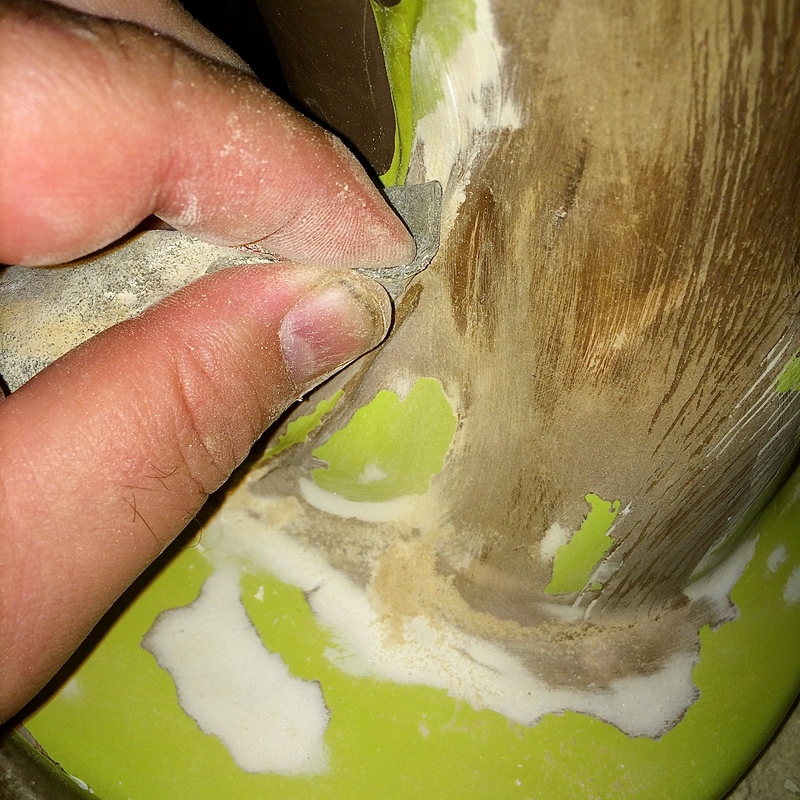 Once dry I blended the edges into the surrounding area to level out the surface. 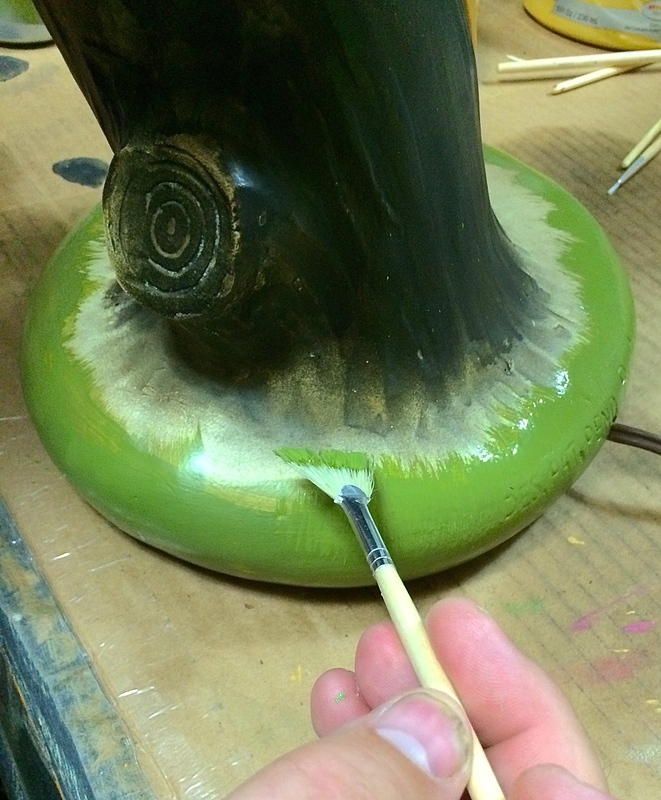 I choose seafoam green paint for the main body of the lamps and stuck with the brown color for the exposed body parts. 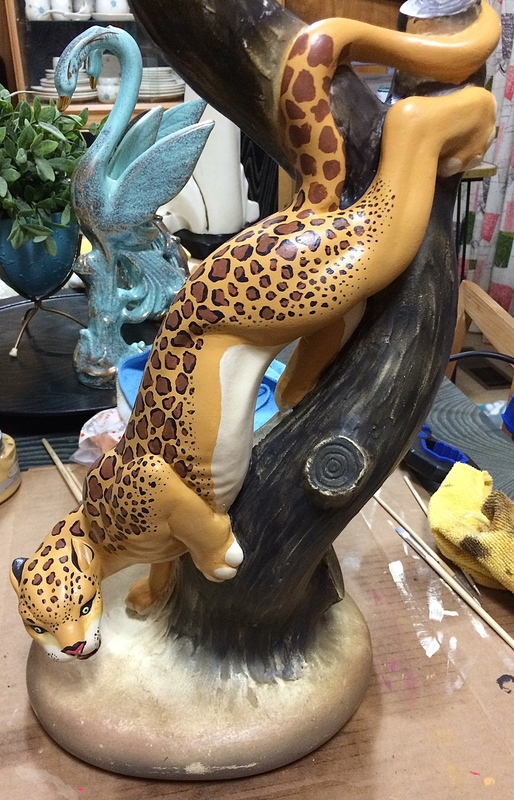 These are the last of the tropical lamps that needed to be restored. 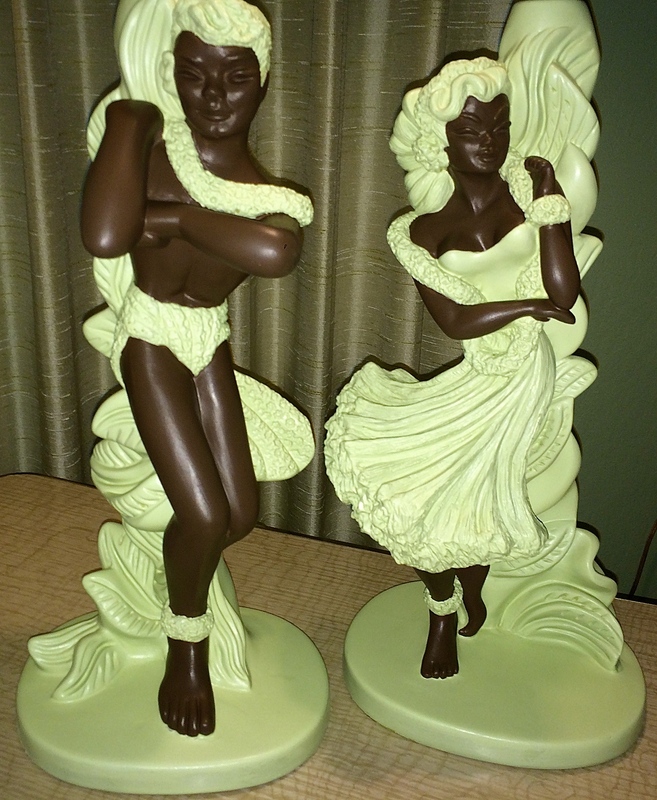 These will look great in the Tiki Room! On to the next restoration! 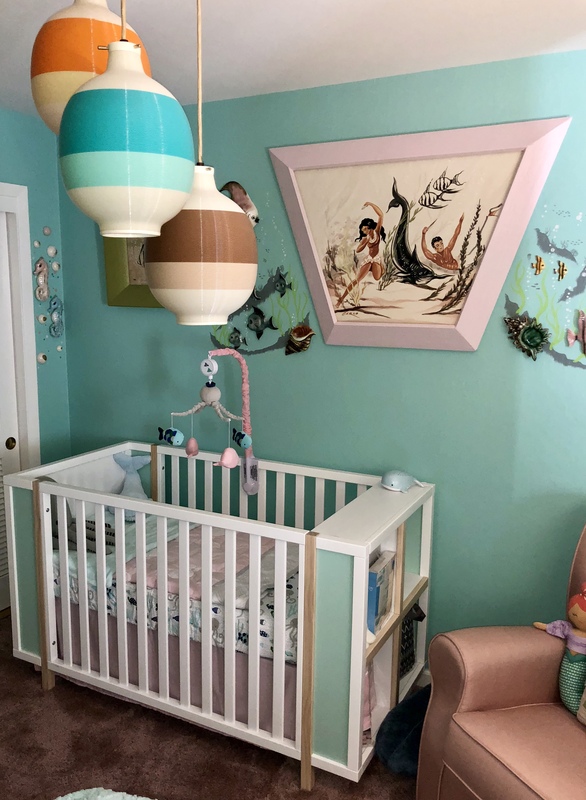 Posted in Restorations and tagged 1950's lamps, 50's lamps, atomic lamp, chalkware, chalkware lamp, chalkware lamps, chalkware reglor, hawaiian reglor lamp, Mid century lamp, mid century lamps, midcentury lamps, plater lamp, Reglor, reglor chalkware, reglor lamp, reglor lamps, reglor of ca, reglor of california, retro lamp, vintage lamp, vintage reglor, vintage reglor lamp. Bookmark the permalink. 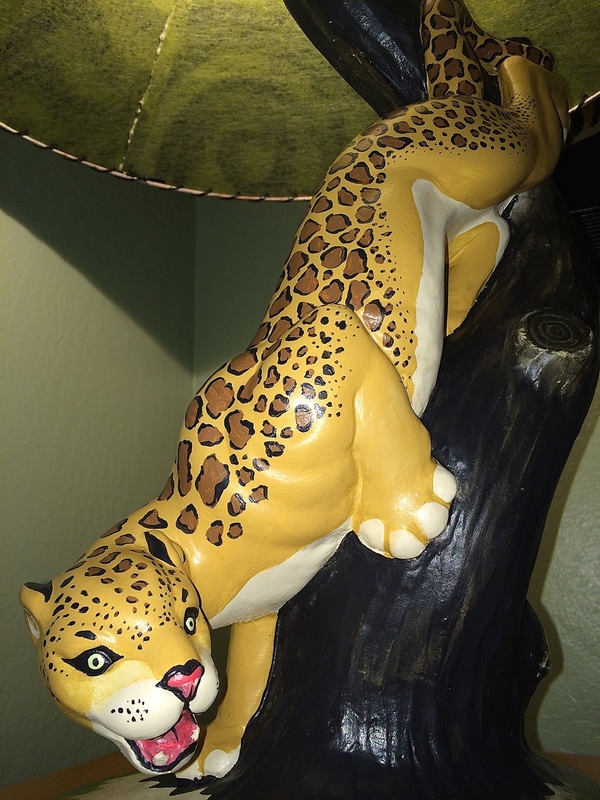 Mel and I picked up this Bo-Low lamp sometime back. 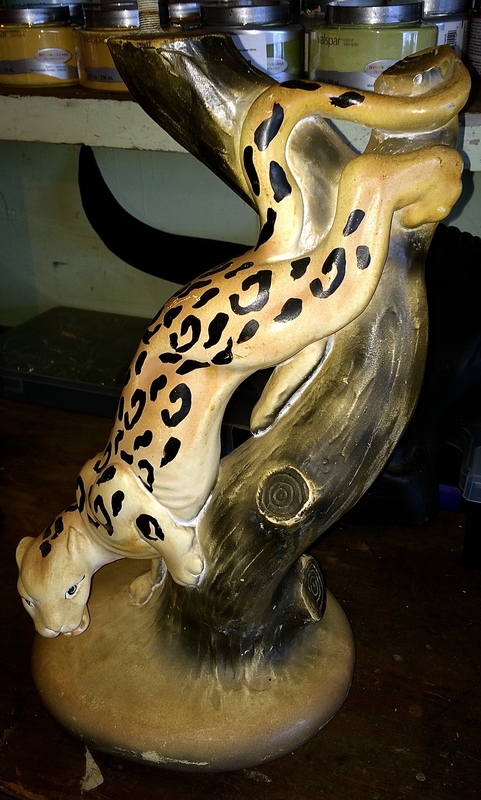 We had been admiring it for a while at a local antique shop and were finally able to acquire it. 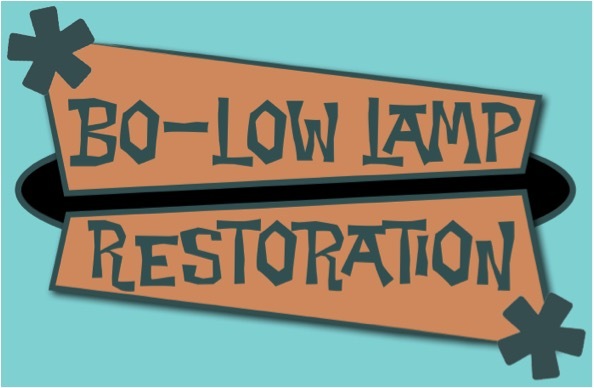 Unfortunately, I wasn’t able to find out anything about the Bo-Low Lamp Co.
As you can see, it looks like it traveled around a bit. It also had a chunk of chalk missing from a part of the top of the tree. I used my usual process to repair it. 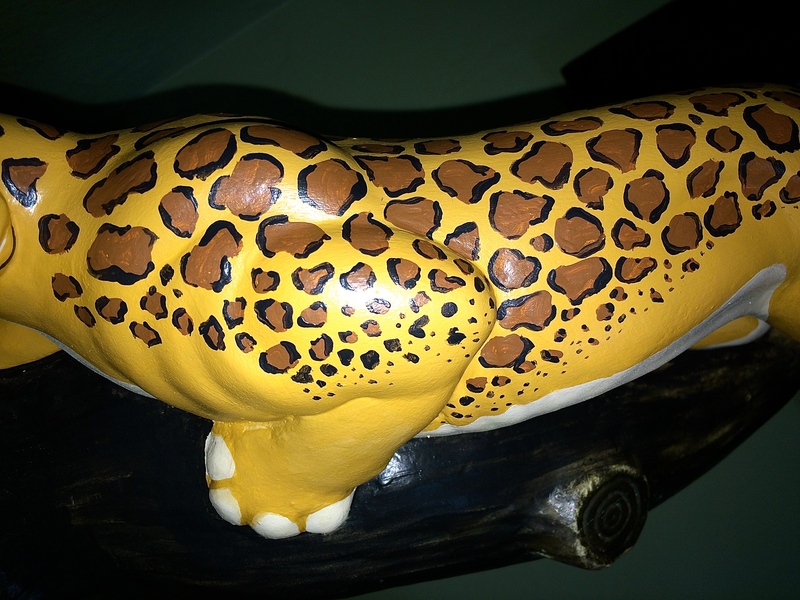 The next step was to paint the whole cat a cream color to help even out it’s finish, and so that the new color would take better. 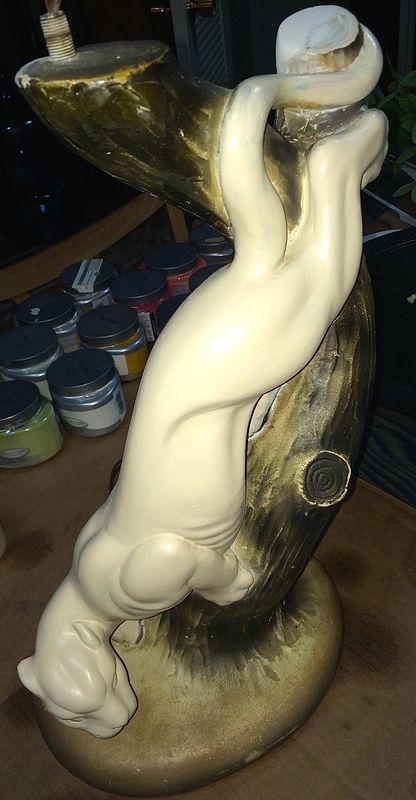 I then applied the main undercoat. 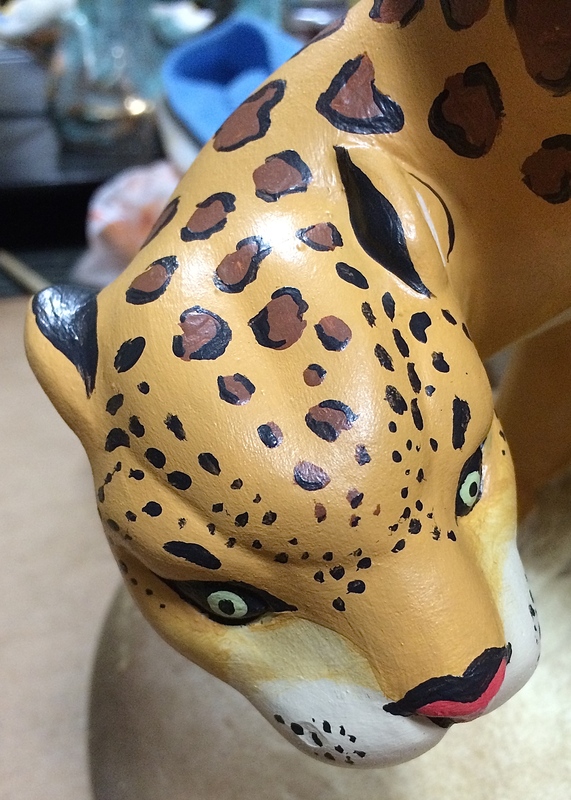 As you can see from this photo, this cat had no real detail and was almost a cream color. Here is the same head shot after I added detail and color. 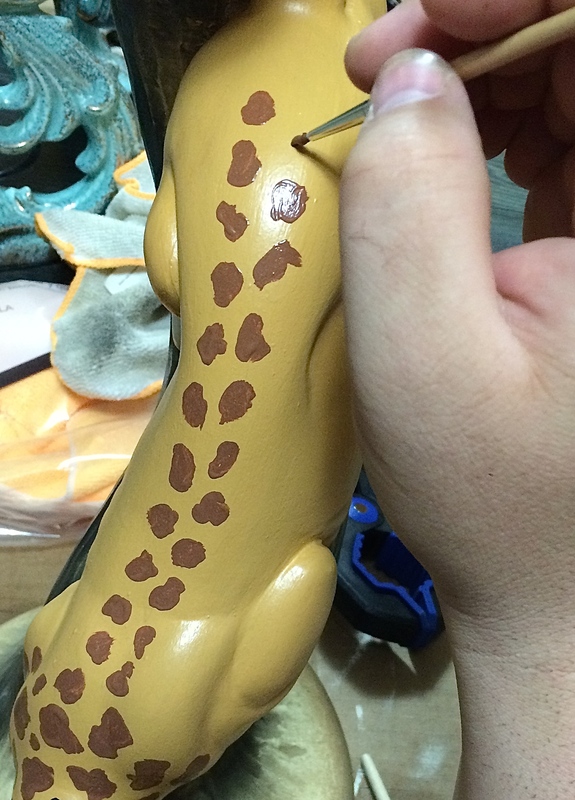 Painting the leopard spots are fairly simple. Just make misshapen marks like I did above. 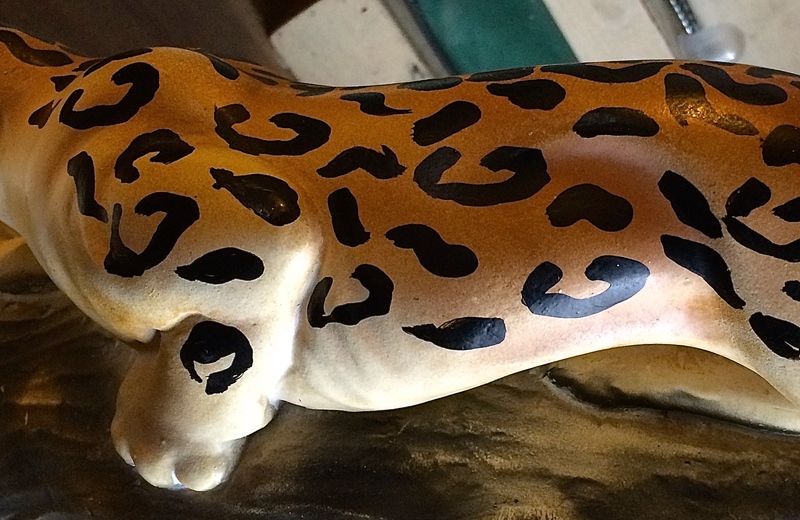 The next step is to apply a small amount of black around parts of the brown to create the tradition leopard spot. Here it is after I refinished it. The original base was just tan so I added a grass effect to the bottom so it would tie in with its awesome shade. 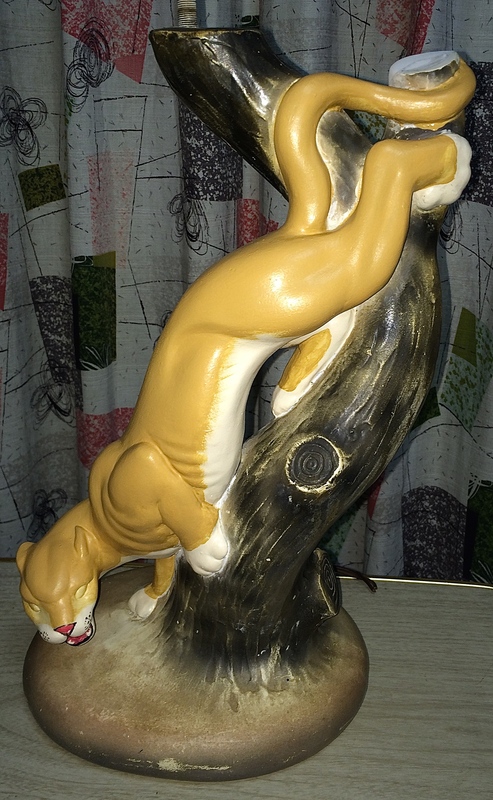 It’s coming along as you can see, just the tail left to complete. Just adding some finishing touches. Ta Da! 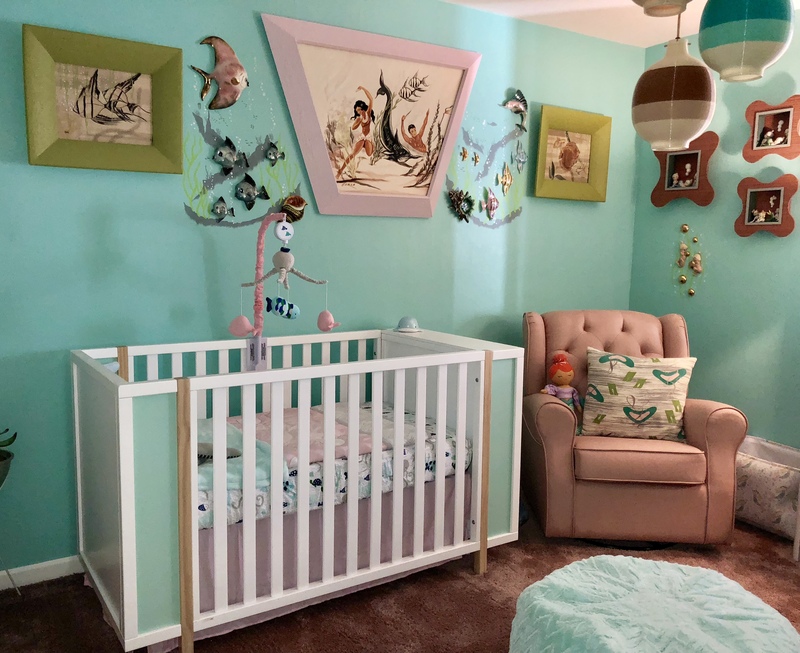 Here it is all done! 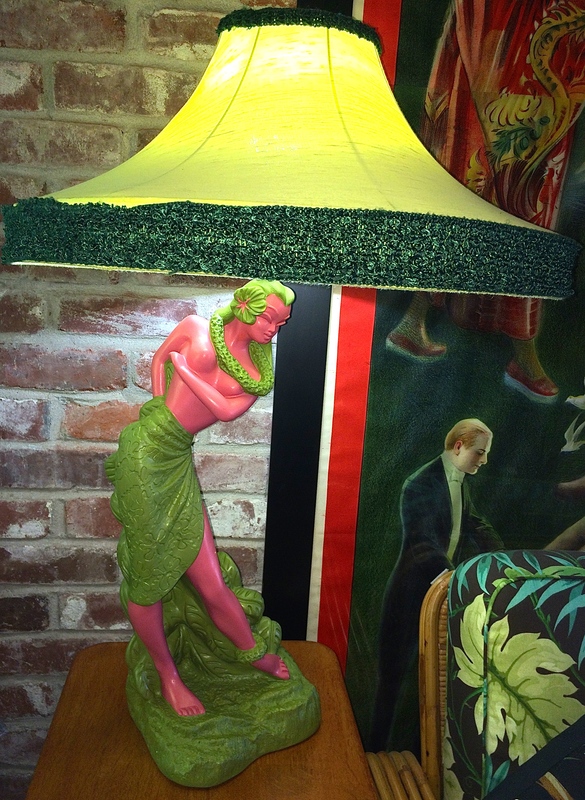 We have had this shade sitting around for sometime, and this seems like the perfect shade for this lamp. 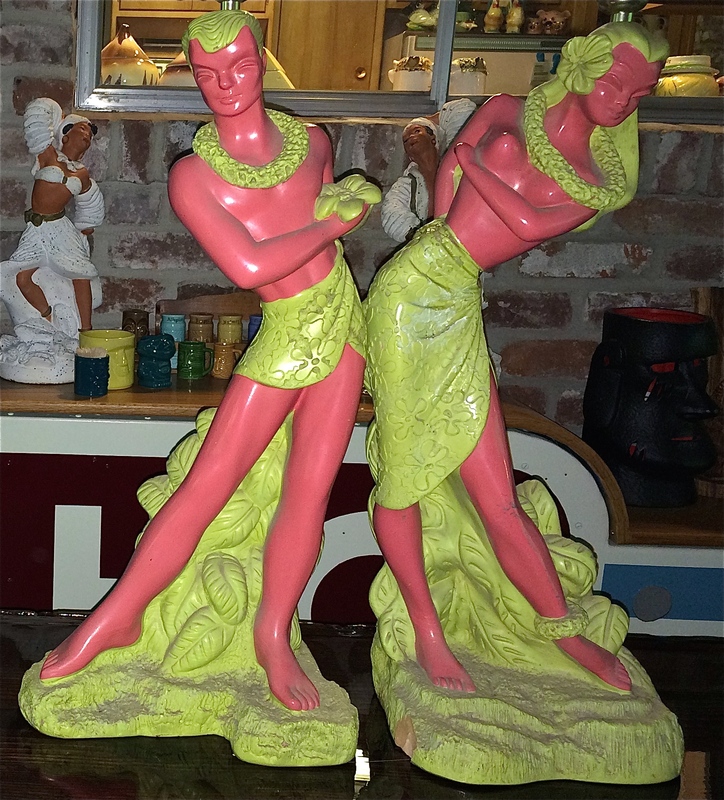 Posted in Restorations, The Makin's Of Our Pad and tagged 50's lamp, bo lo lamp, Bo-Low Lamp Co, bo-low lamp corp, bow-low corp, bow-low lamp corp, chalkware, chalkware continental, chalkware lamp, chalkware lamp repair, chalkware lamp restoration, chalkware lamps, chalkware reglor, chalkware restoration, Continental Art Company, Continental Art Company Chalkware Lamp, Continental Art Company Plaster Lamp, Continental Lamp, jungle cat lamp, jungle lamp, lamp restoration, leopard lamp, mid century lamp restoration, plaster lamp, plaster lamp repair, Plaster Lamp restoration, plaster lamps, plasto chalkware, plasto lamp, plasto manufacturing, plasto plaster, Reglor, reglor lamp, retro lamp, retro lamp restoration, tiki, tiki lamp, vintage lamp, vintage lamp restoration. Bookmark the permalink. 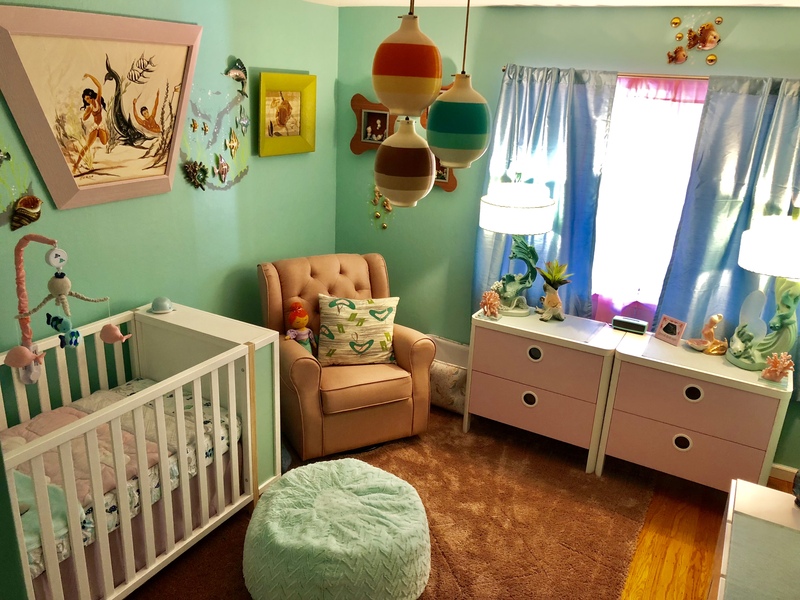 Since Mel and I moved into a fifties ranch style home we have been hard at work making it our own. 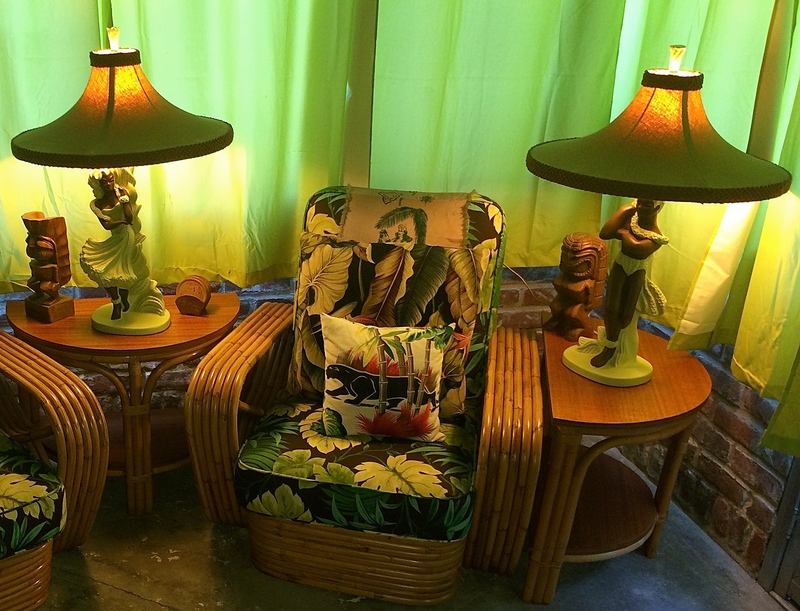 We are fortunate that this home has a lanai and we decided to make that our tiki room. 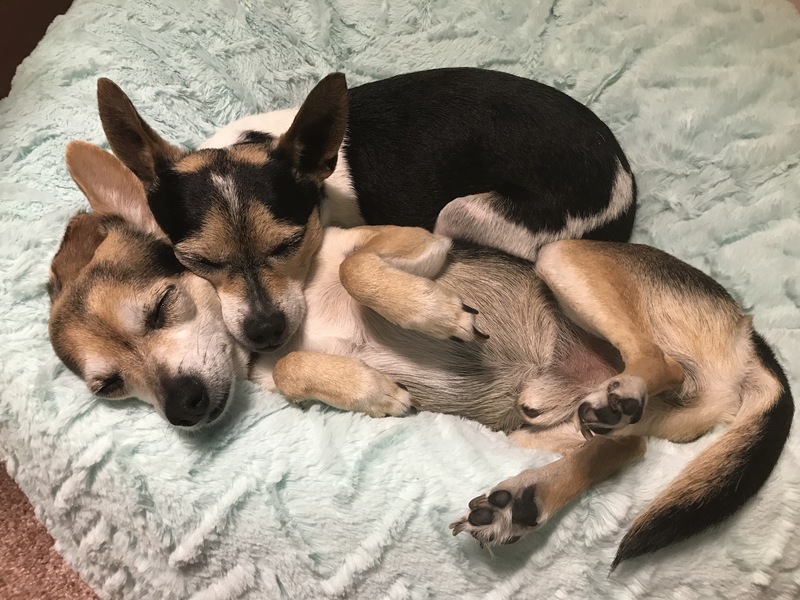 Since we moved from an almost 5,000 sq. ft. home to an almost 1,800 sq. 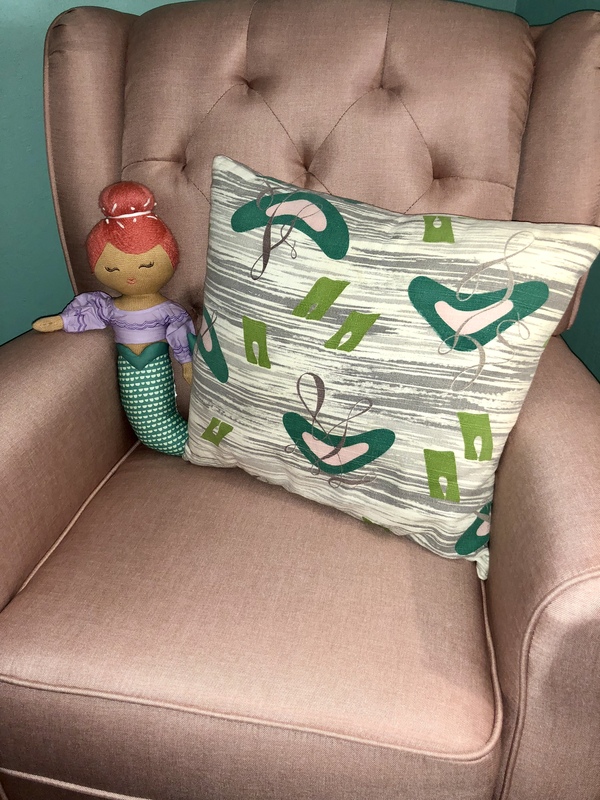 ft. home, we have had to re-evaluate our collection and keep what we think is the best of our collection. 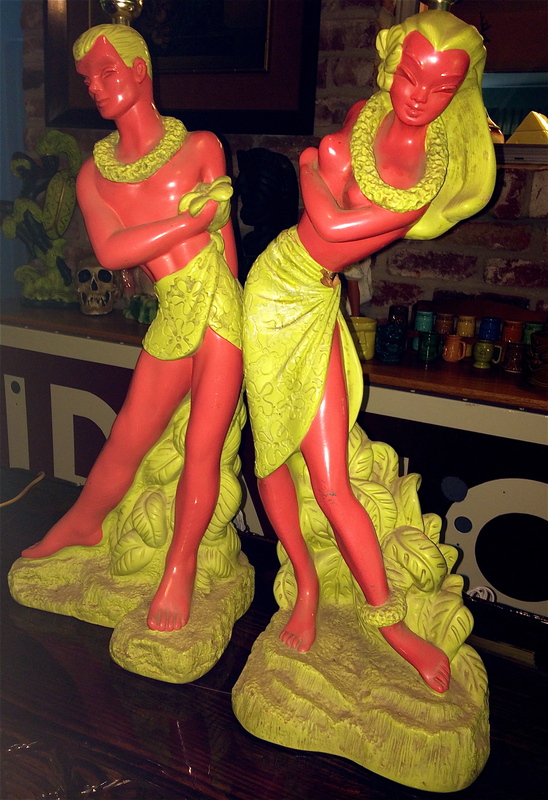 It makes it hard when you find new treasures such as these great Reglor Hawaiian lamps. 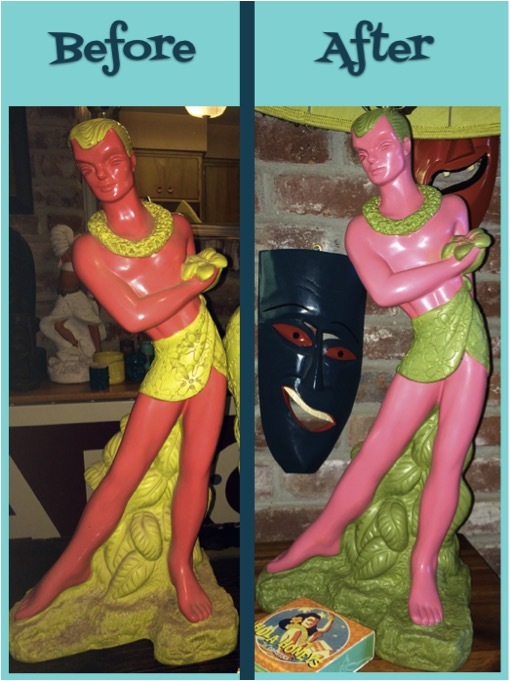 I was unaware that Reglor produced two different Hawaiian lamp sets. Both of these sets are breathtaking and the use of chartreuse makes them that much more atomic! 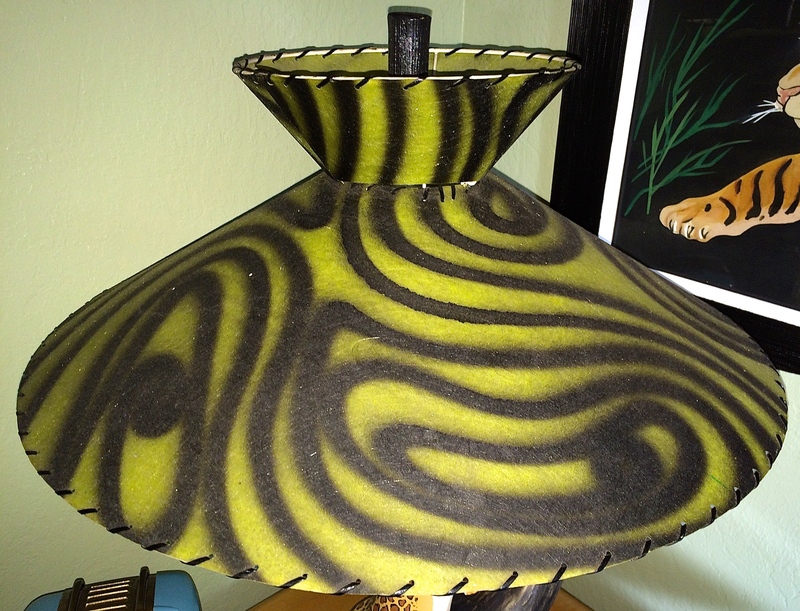 As far as chalkware lamps go, I have always had an appreciation for what Reglor produced. This set is in great overall condition considering its age. I am guessing this set was produced sometime in the late 40’s or early 50’s. Usualy Reglor produced lamps with a thick base and this set has a thin base. This set has some condition issues as you can see. 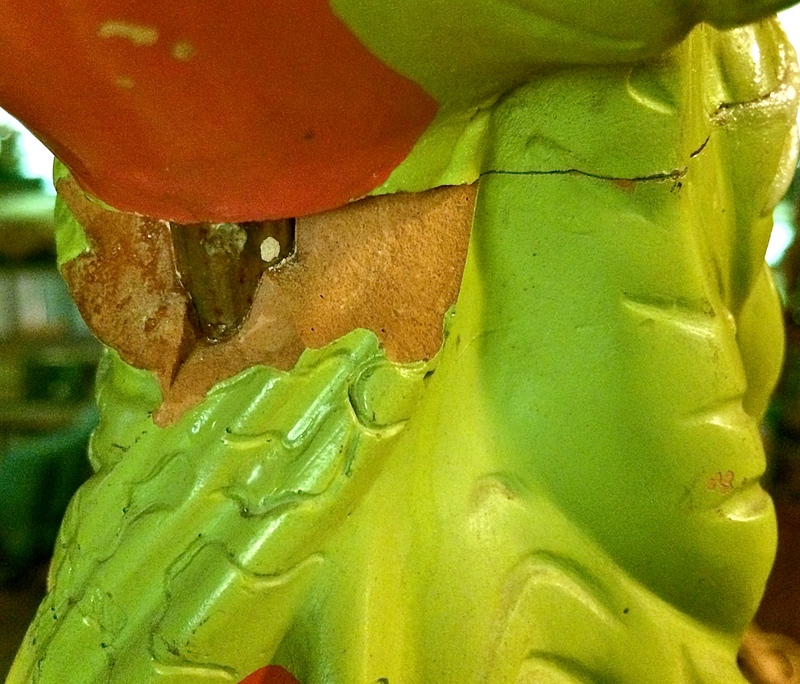 My approach to repair the peeling paint is to remove as much of it as possible. 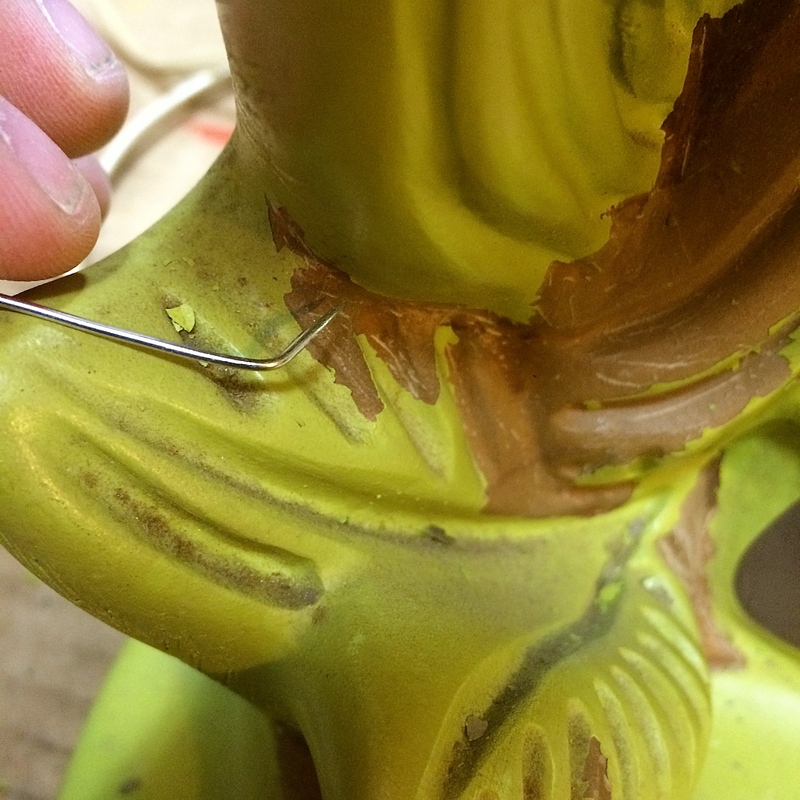 After the peeling paint is removed you have to feather out the edge of the remaining paint into the body of the lamp. This will help make the repair look seamless when painted. Here is our other freshly acquired 1951 Reglor set. 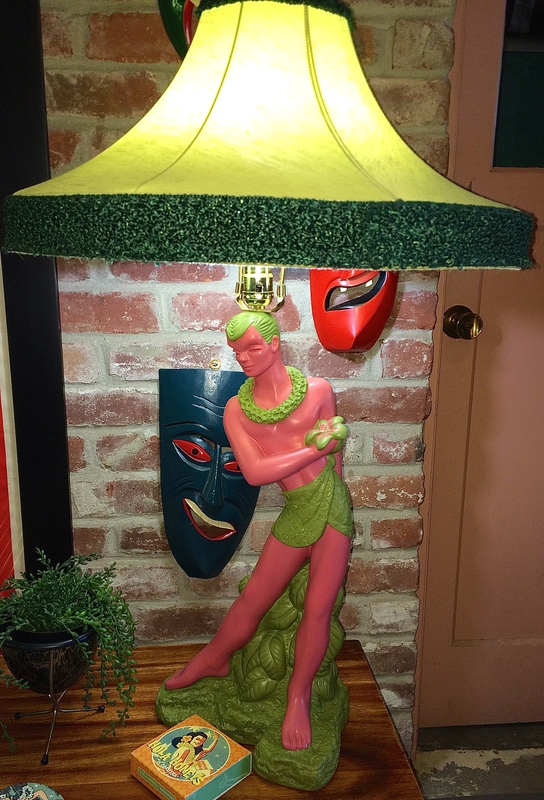 We stumbled across these lamps while cruising Craigslist. These are larger than the other set. The only issue with this set is that the Hawaiian girl has a crack at her waist. 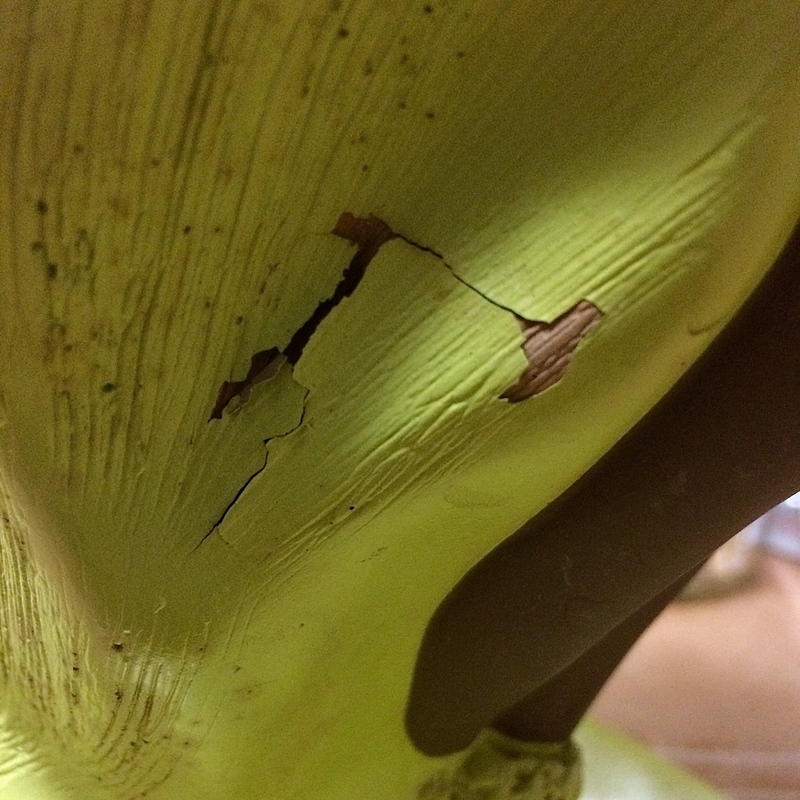 I will repair the crack with my usual process. 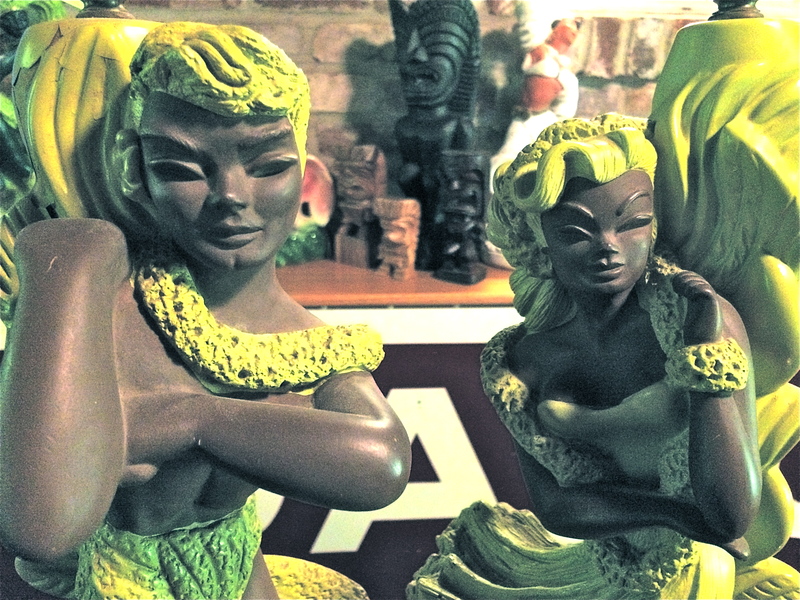 These two sets will really help make our tiki room that much more cooler. 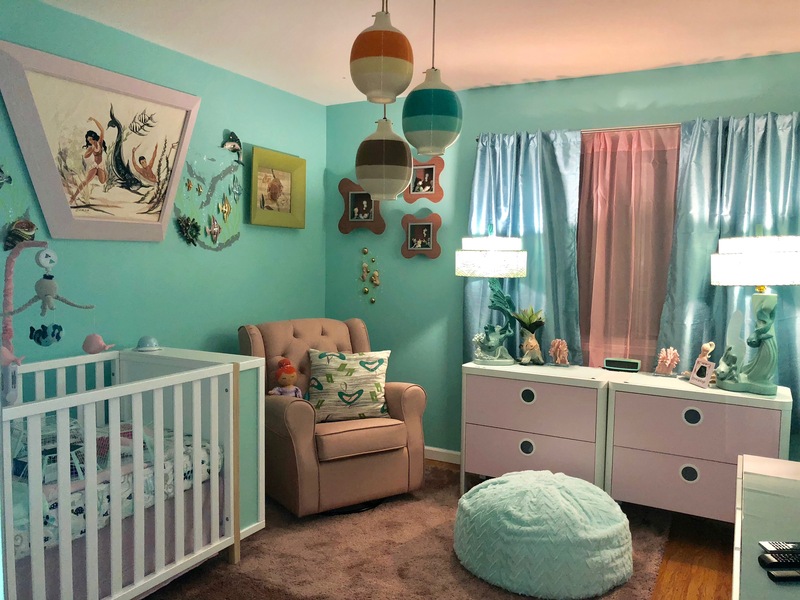 Once we get the house the way we like it we will make sure to showcase it in a future blog. 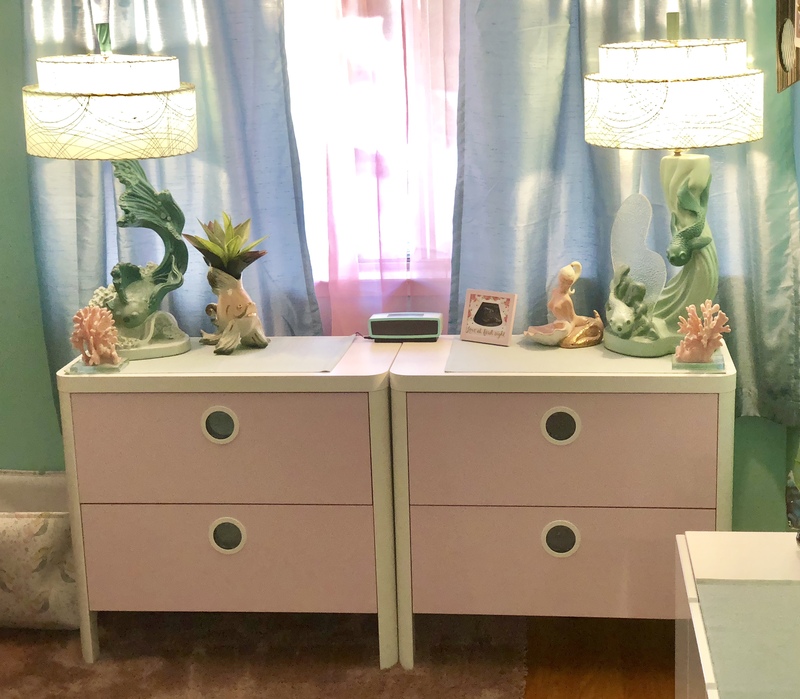 Posted in Restorations, The Makin's Of Our Pad and tagged 1950's lamps, 50's lamps, atomic lamp, chalkware, chalkware lamp, chalkware lamps, chalkware reglor, hawaiian reglor lamp, Mid century lamp, mid century lamps, midcentury lamps, plater lamp, Reglor, reglor chalkware, reglor lamp, reglor lamps, reglor of ca, reglor of california, retro lamp, vintage lamp, vintage reglor, vintage reglor lamp. Bookmark the permalink. 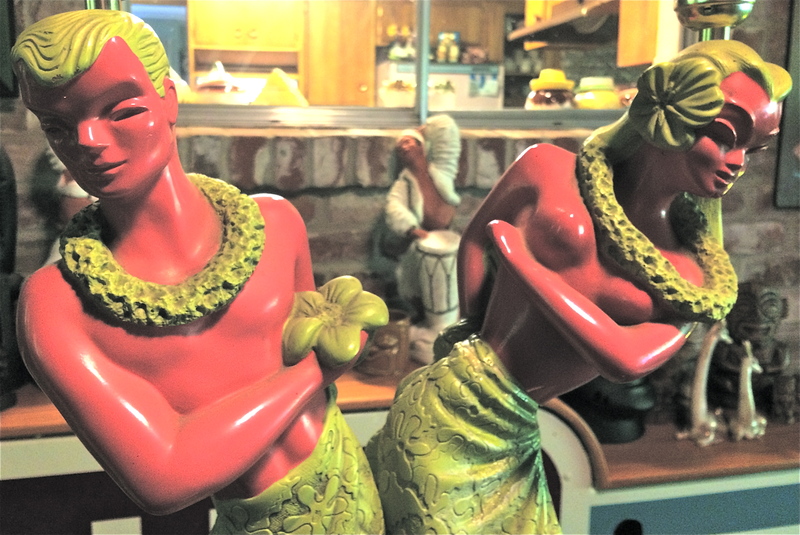 Mel was in Texas on business and was able to squeeze out a little time after work to hit a local antique store where she found these rather large chalkware dancers by ABCO (Alexander Backer Company). These are in really great shape with no chips, cracks or old repairs. ABCO would either do an impression stamp to mark its work or a decal. 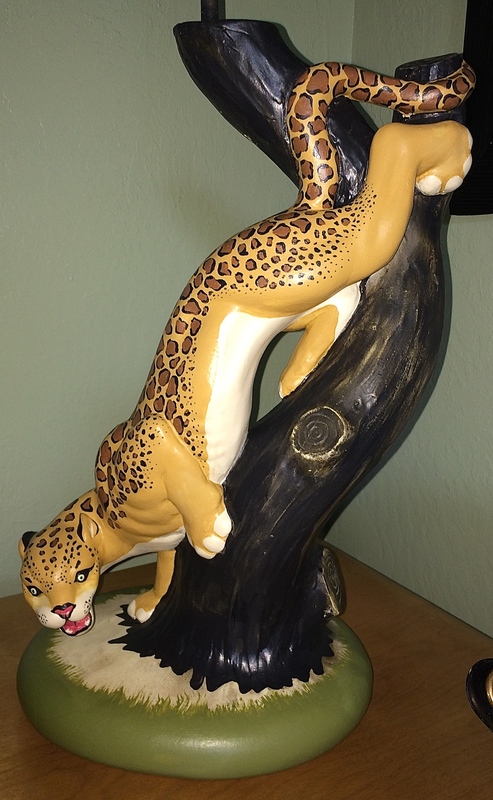 They produced many figures over the years and are pretty collectible. 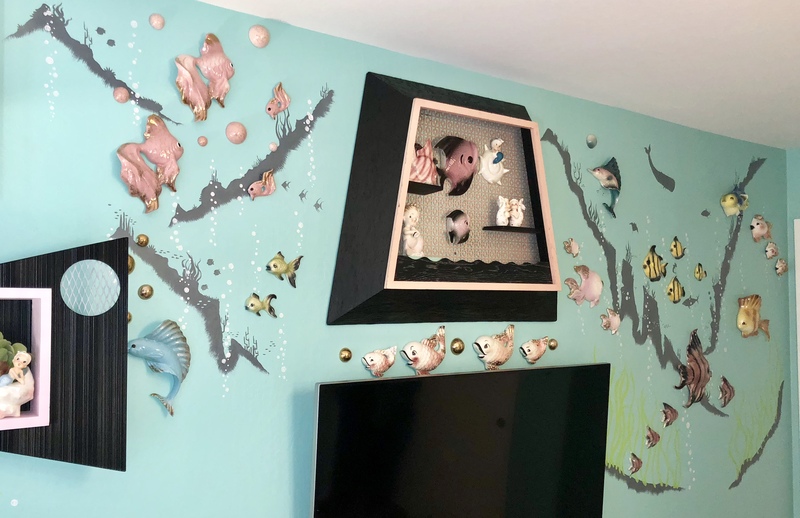 I usually see just the girls hanging on the wall without the metal frame. Mel was fortunate to find such a nice pair. These little flowers are a nice touch. The great thing about these is that I do not have to do anything except hang them! 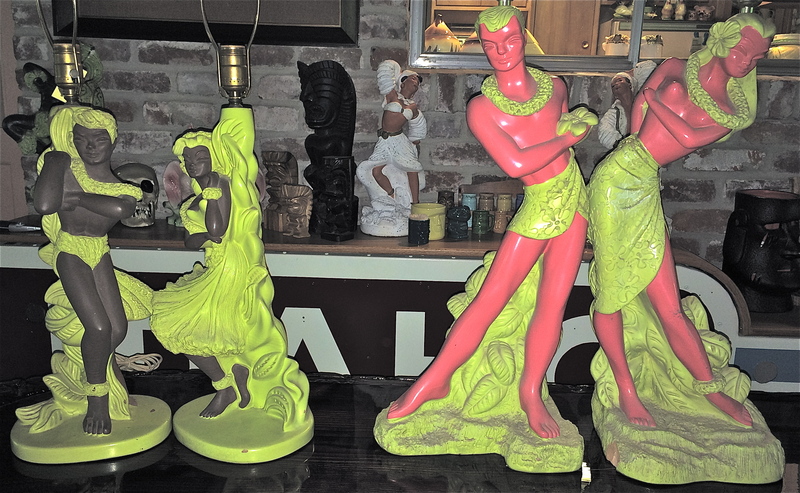 Posted in The Makin's Of Our Pad and tagged ABCO, chalkware, Continental Art Company, mid century, plasto, Reglor, retro, statuary company, vintage. Bookmark the permalink.